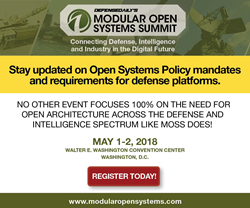 The Modular Open Systems Summit is an expanded and broadened iteration of the former Open Architecture Summit that Defense Daily has hosted for the past 10 years. 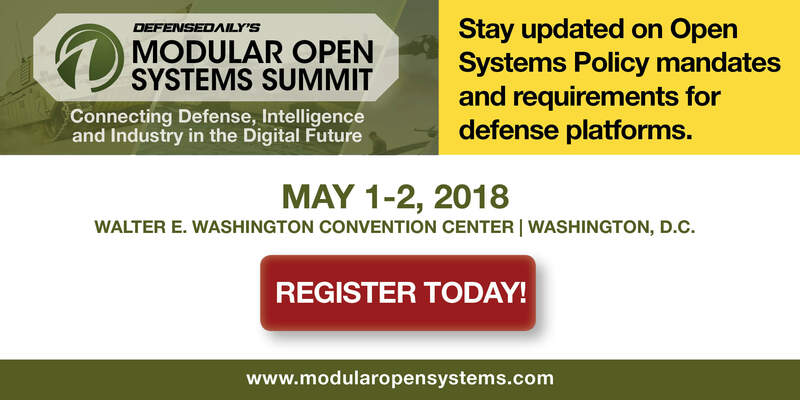 Defense Daily’s Modular Open Systems Summit, taking place May 1-2, 2018 at the Walter E. Washington Convention Center in Washington, D.C., emphasizes how modular open system requirements are becoming both necessary and mandatory to win defense contracts. Why the move from Open Architecture Summit? Open Architecture focused on the engineering and policy surrounding the need to rapidly upgrade defense and intelligence platforms. Modular open systems builds on that foundation but then goes on to demonstrate how modular open systems enable new battle and deterrence approaches such as multi-domain battle and joint war fighting. As part of the National Defense Authorization Acts, modular, open-system approaches are now included as foundational elements to ensure interoperability and rapid acquisition. Rather than focus solely on cost of a system, the military desires platforms that provide best value over their lifecycles. A modular, open approach is essential to extending the platform’s lifecycle, and allows it to be rapidly upgraded—days, weeks or months, vs. years. The agenda and format of Modular Open Systems Summit will be a different and expanded from previous years of Open Architecture Summit. More breakout sessions on specific industry topics. The new format of this event allows more one-on-one networking discussion with your industry colleagues and potential partners. With the addition of a show floor, contractors will display their newest innovations and potential solutions for the DoD. To learn more about this Summit and to register, click here. The Early Bird deadline ends February 16, 2018; register before this date to save up to $150 off the regular rate. Sponsorship opportunities are also available; please contact Tom Williams at 703-522-1440 or tawilliams(at)accessintel(dot)com to learn more. For over 60 years, Defense Daily has been the leading daily publication for business leads and defense market intelligence in global land, sea, air, and space. This award winning publication provides the defense industry insight into business opportunities in aircraft, naval ships and systems, C4ISR, future combat systems, information and electronic warfare, homeland defense, land warfare, net centric warfare, space and satellites, and unmanned systems.